Manufacturers of quality, low-cost electrical components, our range of Enclosed Isolators, Enclosed Changeover Switches, Enclosures and Cable Glands have been available through wholesale distribution channels for many years, and our brand has long been associated with our strapline - Fine Quality at Low Prices! Stag Electrical has been manufacturing electrical products for nearly 30 years, with an emphasis on producing high-quality products, at the most competitive prices. Our core values are carried forward in every product we make, and we are dedicated to continuous research, design and development in order to maintain our position as one of the leading suppliers of electrical equipment to the UK electrical wholesale market-place. We only use the latest technical materials, and our product ranges offer high protection levels from IP44 to IP56 for our enclosure range, to IP65 for our isolator and changeover switch range, and IP68 for our cable gland range. All of our products are manufactured to the latest IEC standards and are CE marked. 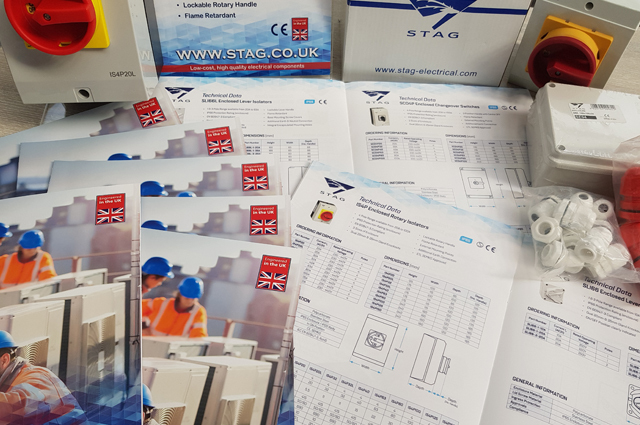 Headquartered in Hatfield, Hertfordshire, Stag Electrical is a proud British brand: our product development all takes place in the UK as does all of our customer service and support. In this modern age where price almost dictates a product's success, here at Stag we strive to produce high quality products and a price point that makes sense. When you buy Stag, you can rest assured that you are making a wise purchase. Thousands of UK Tradesmen buy Stag. We produce high quality supportive materials for all our products, including in-depth technical data for every product enabling easier specification.